Virtual reality has long been considered a thing of science fiction but is quickly becoming science fact. In 2017 alone, virtual and augmented reality startups raised over US$3B in venture capital globally. This is on the back of a rapidly changing tech and business landscape, driven by Moore’s Law and lowering the barriers to high tech entry for today’s startups. For industry incumbents, this means that it’s no longer a matter of choosing whether or not to innovate, it’s a matter of innovate or die. Unfortunately for many incumbents, it’s not as simple as flicking a switch to transition from “the way things have always been done around here” to thinking and working like a disruptive startup, nor should they. Large organisations have been built to deliver on a repeatable, scalable business model that makes money today, but it can’t come at the expense of what will create value and make money tomorrow. While many incumbents are slowly navigating the path forward to becoming more innovative internally, some are also looking outside the building to fast-track innovation by partnering with emerging tech startups in their field. A corporate accelerator program brings together the domain expertise, resources and networks of a large industry incumbent with the talent, tech and speed of startups, to leverage each other’s strengths and create new game-changing solutions; it’s kind of like bringing together the power of George Foreman with the speed of Muhammad Ali. Village Roadshow, a major operator of theme parks, cinema, film production and distribution sought to complement its internal digital innovation initiatives by gaining exposure to emerging talent in the VR and AR space to help it augment its offerings across cinema, film and gaming. As such, Village partnered with Collective Campus to develop and run Australia, and Asia-Pac’s first VR/AR accelerator program, the Village Xperience Accelerator. The program was co-sponsored by Microsoft and Telstra Labs and was also supported by a number of program partners such as HTC, Amazon Web Services, SendGrid, Zendesk, HubSpot, Autopilot and Devika. We sat down with key executives from Village such as CDO Jon Satterly and digital strategy manager Elaine Rojas to gain a better understanding of its business model and strategy. We used this to inform the types of startups we were looking for. We ran an elaborate online marketing campaign as well as roadshow events in Sydney and Melbourne to attract startups from across Australia. The roadshow events brought together thought leaders in the VR and AR space, as well as program mentors, to discuss the future of entertainment as well as drum up additional interest in the accelerator program. When all was said and done, we secured 50 applications to the program. In addition to business model and strategic alignment, we evaluated the startups across a number of factors, including management team, traction, value proposition, market opportunity, defensibility and more. This informed an initial shortlist of 15 startups that were invited along to our 2-day bootcamp held at Collective Campus.. Having worked with the startups across the two days to better understand and hone their business models, the scene was set at program partner Telstra Labs’ digs for the pitch night where each of the 15 startups shared their vision and how they plan to execute on it. With only four spots available for the startups, it made our decision after the bootcamp incredibly difficult as there were always going to be some high potential candidates that missed out. FlexiSpaces, an internal project team from Charter Hall, were given a wildcard entry into the program and are working to optimise underutilised space by leveraging sharing economy fundamentals. The 13 week accelerator program brought together a number of mentors such as Benjamin Chong of Right Click Capital, Jonathan Hannam of Taronga Group, David Hodges of Loc8, Julian Boot of Equiem, Shelli Trung, Josh Rowe of RealAs and Jon Ellis of Investorist. Aside from the mentoring, startups participated in weekly workshops on topics such as finding product market fit, branding and communication, marketing and sales tactics, leadership, time management and more in addition to business model coaching sessions with the team at Collective Campus. 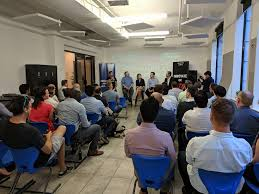 Finally, the startups sat in strategy sessions with executives from Charter Hall across its industrial, retail and office divisions, they were introduced to numerous influential stakeholders across Charter Hall’s network and got pilot programs off the ground. 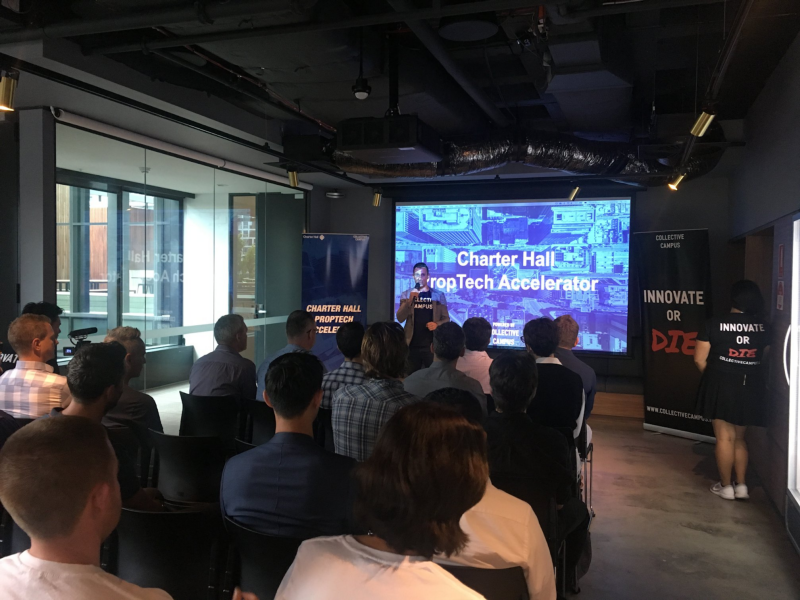 The program culminated with the Demo Day at Charter Hall HQ in Sydney where startups had an opportunity to present what they had achieved during the program and what was next in front of an audience of real estate players, investors and tech enthusiasts. Snaploader accelerated during the program, doubling its monthly revenue during the 13 week program. InspaceXR established a pilot program for Charter Hall and is now working with the company on its 130 Lonsdale St development. Estate Baron is working with Charter Hall to explore applications in the blockchain space and has partnered with Collective Campus to establish Konkrete, a blockchain-based platform whose mission it is to help more Australians afford property. Bricks & Agent experimented rapidly throughout the program and closed a number of deals, including a significant deal to provide its platform to Little Residential’s property managers. FlexiSpaces, a team comprised of Charter Hall employees, developed a minimum viable products for its commercial real estate sharing platform, which is being tested internally. Charter Hall continues to work with all of the startups. The program generated lots of media interest across Australia and Asia and contributed to Charter Hall making the Australian Financial Review’s Top 20 Most Innovative ASX200 Companies list, in addition to its CTO, Aidan Coleman, making the CIO50. Since the Charter Hall Accelerator program was announced in late 2017, two new proptech accelerators have followed, including the Colliers Proptech Accelerator in Toronto and Propell Asia in Singapore, backed by JLL and Lend Lease. The former also announced a US$100M proptech venture fund called Spark Global. Thinking About Running an Accelerator Program?